As countries work to promote and achieve Universal Health Coverage (UHC), maintaining and improving quality in health care is emerging as a priority. 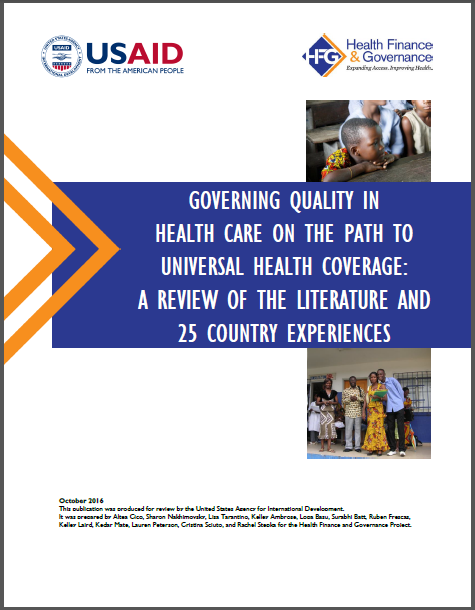 While research has been conducted on service delivery and financing schemes for UHC, little consolidated knowledge or guidance is available on institutional arrangements and their impact on quality of care in the context of UHC. Responding to this need, the HFG project conducted a literature review to attempt to document global experience in institutional roles and relationships governing quality of care in the health sector, and to identify successful features or factors when structuring institutional roles, responsibilities, and relationships. We used a decision tree and applied inclusion and exclusion criteria to narrow our analysis to a representative sample of 25 countries that showed low to high quality improvement over 10 years, with associated low to high human development, and with generally low enough corruption scores not to put in question the country’s indicators of improvement and development. To obtain a representative country sample, criteria applied for country selection included a calculated composite score based on the percent rate of change in infant mortality and maternal mortality between 2000 and 2013; corruption perceptions scores; geographic location; level of human development attained; and expert knowledge of governance of quality in the countries. We searched published and gray literature and consulted with global and country experts to identify relevant documents.